The nation of Japan has long been regarded as being at the forefront of emerging technology. And when it comes to solar energy, they are nothing if not far-sighted and innovative. Whereas most nations are looking at building ground-based solar farms in the next few years, the Japanese are looking at the construction of vast Lunar and space-based solar projects that would take place over the course of the next few decades. 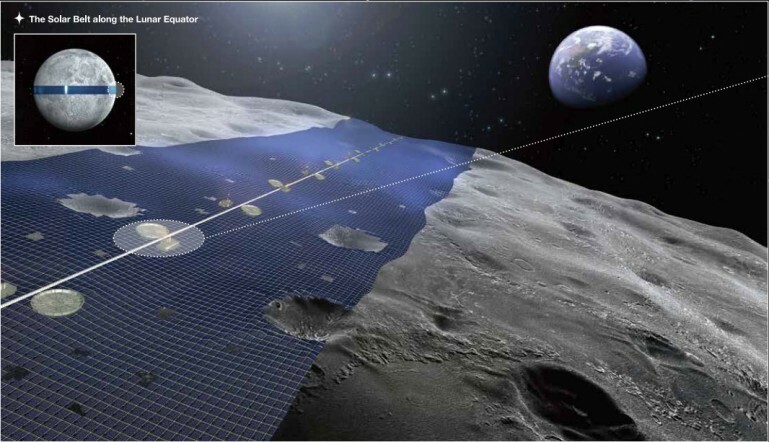 The latest proposal comes from the Japan Aerospace Exploration Agency (JAXA), which recently unveiled a series of pilot projects which, if successful, should culminate in a 1-gigawatt space-based solar power generator within just 25 years. 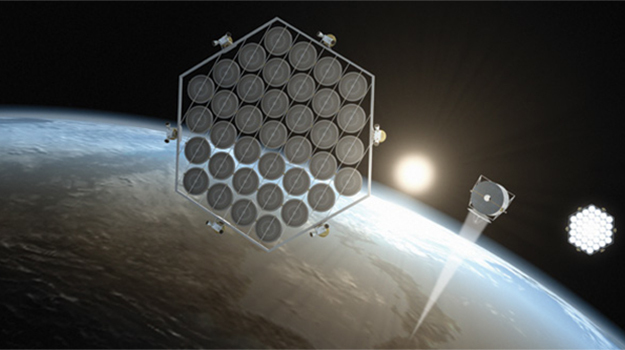 Relying on two massive orbital mirrors that are articulated to dynamically bounce sunlight onto a solar panel-studded satellite, the energy harvested would then be beamed wirelessly to Earth using microwaves, collected Earth-side by rectifying antennas at sea, and then passed on to land. JAXA has long been the world’s biggest booster of space-based solar power technology, making significant investments in research and rallying international support for early test projects. And in this respect, they are joined by private industries such as the Shimizu Corporation, a Japanese construction firm that recently proposed building a massive array of solar cells on the moon – aka. the “Lunar Ring” – that could beam up to 13,000 terawatts (roughly two-thirds of global power consumption) to Earth around the clock. Considering that Japan has over 120 million residents packed onto an island that is roughly the size of Montana, this far-sighted tendency should not come as a surprise. And even before the Fukushima disaster took place, Japan knew it needed to look to alternative sources of electricity if it was going to meet future demands. And considering the possibilities offered by space-based solar power, it should also come as no surprise that Japan – which has very few natural resources – would look skyward for the answer. Beyond Japan, solar power is considered the of front runner of alternative energy, at least until s fusion power comes of age. But Until such time as a fusion reaction can be triggered that produces substantially more energy than is required to initiate it, solar will remain the only green technology that could even theoretically provide for our global power demands. And in this respect, going into space is seen as the only way of circumventing the problems associated with it. Despite solar power being in incredible abundance – the Earth’s deserts absorb more energy in a day than the human race uses in an entire year – the issue of harnessing that power and getting it to where it is needed remain as stumbling blocks. Setting up vast arrays in the Earth’s deserts would certainly deal with the former, but transmitting it to the urban centers of the world (which are far removed from it’s deserts) would be both expensive and impractical. Luckily, putting arrays into orbit solves both of these issues. Above the Earth’s atmosphere, they would avoid most forms of wear, the ground-based day/night cycle, and all occluding weather formations. 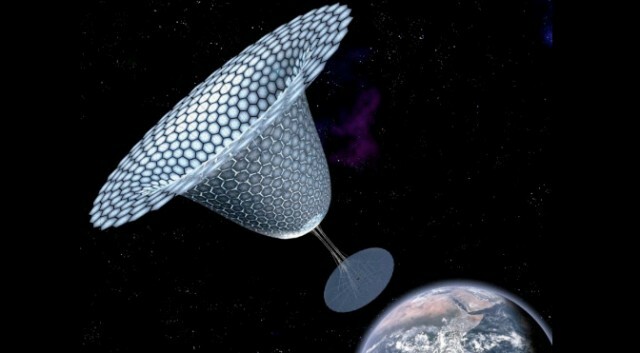 And assuming the mirrors themselves are able to reorient to be perpetually aimed at the sun (or have mirrors to reflect the light onto them), the more optimistic estimates say that a well-designed space array could bring in more than 40 times the energy of a conventional one. The only remaining issue lies in beaming all that energy back to Earth. Though space-based arrays can easily collect more power above the atmosphere than below it, that fact becomes meaningless if the gain is immediately lost to inefficiency during transmission. For some time, lasers were assumed to be the best solution, but more recent studies point to microwaves as the most viable solution. While lasers can be effectively aimed, they quickly lose focus when traveling through atmosphere. However, this and other plans involving space-based solar arrays (and a Space Elevator, for that matter) assume that certain advances over the next 20 years or so – ranging from light-weight materials to increased solar efficiency. By far the biggest challenge though, or the one that looks to be giving the least ground to researchers, is power transmission. With an estimated final mass of 10,000 tonnes, a gigawatt space solar array will require significant work from other scientists to improve things like the cost-per-kilogram of launch to orbit. It currently costs around $20,000 to place a kilogram (2.2lbs) into geostationary orbit (GSO), and about half that for low-Earth orbit (LEO). Luckily, a number of recent developments have been encouraging, such as SpaceX’s most recent tests of their Falcon 9R reusable rocket system or NASA’s proposed Reusable Launch Vehicle (RLV). These and similar proposals are due to bring the costs of sending materials into orbit down significantly – Elon Musk hopes to bring it down to $1100 per kilogram. So while much still needs to happen to make SBSP and other major undertakings a reality, the trends are encouraging, and few of their estimates for research timelines seem all that pie-eyed or optimistic anymore.